This specialist operator runs some of the best trips to view the Northern Lights in the world. The site is based on a template we produced for their sister company, but with tweaks to the branding, the imagery and colour palette - this really does look amazing - that a look for yourself. 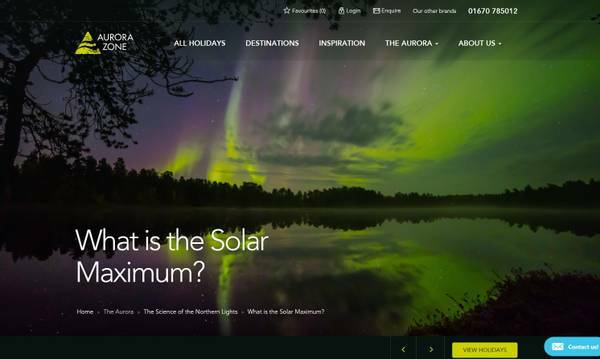 The science pages on this website are amazing - I'm now a bit of an Aurora expert just from looking at this site! We particularly enjoyed creating the Science pages on the Aurora Zone website - something very unique and bespoke, all of which renders beautifully on mobile. The directors have specific knowledge of tour operation, having backgrounds in Adventure Travel, Sailing Holidays, Ski and many other small to medium sized tour operators.